If you were asked to build a football player he would end up looking like Josh Allen (#41). He didn’t always look this way. He was lightly recruited out of high school, until his senior season he was mainly a wide receiver, and he was an all-state selection as a junior. As a senior, he had is most productive season on the defensive side of the ball, totaling 75 tackles, 21 for a loss, and 22.5 sacks (led the state of New Jersey in that last category). He was a 2-star recruit and was a lanky, 210 pound player, so he didn’t receive a lot of national attention nor many offers, so he accepted an offer to play at Monmouth University, an FCS school. Then Kentucky came calling after 6 straight losses at the end of the 2014 season helped lead to 9 recruits de-committing, 8 from the defense. The journey paid off for Allen and for Kentucky when he helped lead them to their biggest win total since 1984. He led the SEC in tackles for a loss (18.5), sacks (14) and forced fumbles (5) and was named SEC Defensive Player of the Year. Throw in 84 tackles, 4 passed defensed and 2 fumble recoveries and it leads to a highly decorated season. Winning the Chuck Bednarik Award for Defensive Player of the Year and the Bronko Nagurki Trophy for Best Defensive Player capped of an outstanding senior season. He will now play in the Citrus Bowl vs Penn State and then in the Senior Bowl before heading to the NFL draft where he shouldn’t have to wait very long to be selected. 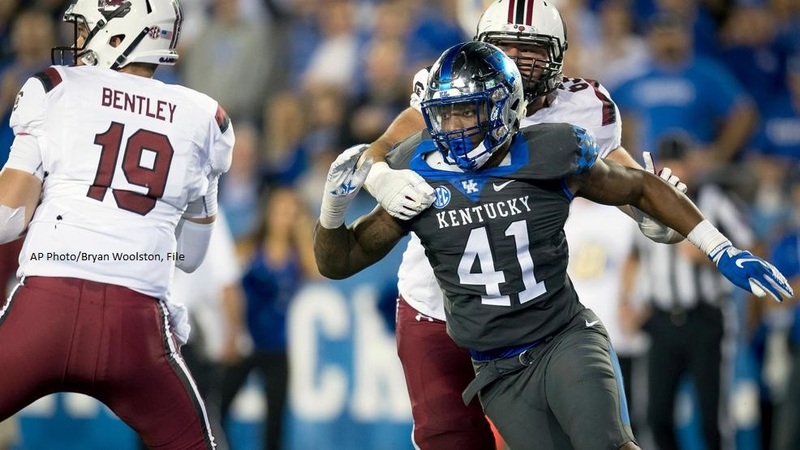 Size – Added weight while at Kentucky and at 6-foot-4 and 258 pounds, he has prototypical size to play on the edge. Acceleration – Very good burst to get off the ball to put pressure on the offensive lineman and when playing the backside on running plays he can chase down just about anyone. Pass Rushing – Has the speed and flexibility to get around the edge, quickness to split an inside gap and a good rip to both sides to get under the blocker. Very good at attacking the ball when rushing the quarterback to force fumbles. Versatility – He is not just a pass rusher. He plays the run well and can set the edge and drop into zone coverage and run with tight ends and running backs in man coverage to the outside and downfield. Effort – Not one to watch plays when they go away from him. Will chase across and down the field. Balance – Whether in a 2 point stance rushing the passer or as a 6 technique over the tight end, he gets on his toes anticipating the snap and will lose his balance forward which can limit his play strength at the point of attack and his explosiveness when rushing. Taking on the pulling block – Being the athlete that he is, he’ll try to duck under the blocker to the inside instead of taking on the block with his inside shoulder to force the play inside. Bull Rush – Doesn’t transition from speed to power as well as you’d like at this point but is something he can improve on. Pass Rush Moves – Uses a speed, rip and chop well but needs to add more to succeed consistently at the next level. Use of a spin and long arm would be two moves that would make him even tougher to defend. Burst and Bend – Against Florida, rushing from the right he shows very good acceleration at the snap to get upfield to pressure the tackle and uses a chop to get the hands down. Good ankle flexion and bend around the corner. QB Feleipe Franks (#13) luckily tucks the ball after pumping to the right or else this is likely a strip sack. Read and React – Against Florida, out in the slot, head up over TE C’yontai Lewis (#80). With eyes in the backfield, he reads the play, mirroring the receivers movement and explodes upfield and through the would-be blocker to force the incomplete pass. Quickness to the inside – Against Missouri, lined up as the 6 technique on the right over the tight end. Reading pass, he attacks straight at the tackle and uses quickness and agility with what looks like a swat/swim move to the B gap to get in nearly untouched and get the strip sack. Play Strength – Against Georgia, lined up as the 5 technique on the left side. Quick hands up to the chest of the tackle able to get under him a bit. Outside leverage by linebacker Jordan Jones (#34) forces the runner back inside. Allen is able to disengage from 340 pound tackle Isaiah Wilson (#79) and make the tackle near the line of scrimmage. He’ll be one of the hottest prospects heading into the 2019 NFL Draft. After quarterback, pass rushers are the prime need for NFL teams. However he won’t be limited to just being a pass rusher. Highly athletic and scheme versatile, he is just what today’s NFL is looking for. He’ll be able to play at the LOS or off the ball in situations. He’s an every down defender who can cover tight ends and running backs. And he has the ability to set the edge or stack and shed against the run. It’s almost scary to think that he still has room to improve and get better. He is fun to watch and easy to root for and to whoever drafts him, your fans will be forever grateful. Follow Tom on Twitter @THMead3. Check out his other work here, such as his look at fellow Senior Bowl participants TCU pass rusher Ben Banogu and Washington RB Myles Gaskin or his look at how paying a high salary veteran QB may hurt your chances of winning.